Spring cleaning has been going on for centuries. On the first warm day of the year, people would open their windows and doors, let fresh air in, and clean out the old ash and dirt from a home. Technology and spring cleaning techniques have certainly evolved, but it is still just as important to thoroughly clean your home from top to bottom at least once a year. Back in January we resolved ourselves to get more organized and keep our homes clean for the New Year. Now, spring is around the corner and some of the projects we wanted to do have fallen by the wayside. March is a great month to start working on the spring cleaning projects and our spring cleaning tips below can help. There are certain cleaning tasks that are universal throughout the house. These tasks include washing down walls and ceilings, cleaning windows and screens, shampooing and vacuuming rugs, along with replacing smoke alarm batteries. But each room in a spring cleaning project will also bring its own challenges and rewards. By creating a spring cleaning checklist with clear goals and strategies for the different areas of your home, you will complete your project quicker and more effectively. Below are some spring cleaning tips from the largest parts of your home to the smallest. Attics become a “store-all” for everything from toy collections to holiday decorations. Spring cleaning is the best time to declutter and reorganize the attic before it gets too hot and humid. Sort through items in the attic and donate, sell or store the items you no longer need. Sweep the floors and wipe down the corners and windows. Organize the remaining items into categories, such as holiday or children’s toys. We spend most of our time in our home sleeping in the bedroom. Therefore, they are the most important rooms in the house to properly clean. Turn over the mattresses and vacuum. Clean the linens including mattress pads, blankets, sheets, comforters and pillows. Replace winter blankets with summer blankets. If you store items under the bed, make sure that you sort through these items before returning them back to their storage spot. Dust the dressers, chests and night stands and vacuum the carpet. The bathroom might be the smallest room in the house, but it is the one that most people dread to clean! It is very important to clean the bathroom from top to bottom while cleaning and wiping down the medicine cabinet. Throw away any expired cosmetics, beauty products, lotions and medicine. Restock the first aid kit. Scrub the shower, tub, sinks and toilet. Clean the grout in tiles if that is needed. Replace the shower curtain and liner. Wash down the windows and window treatments. Clean and reorganize linen closets. Other than the bedroom, the living room is the most “lived in” room. It is very important to give the room a good cleaning from top to bottom. Dust the ceiling and all wall corners. Use vacuum attachments to get to the corners in the wall and along the baseboards. Vacuum the dust and clean inside upholstered chairs and couches. Clean underneath and behind couches and chairs. Remove books and knickknacks from shelves, display cases or tables and individually clean them. Then, dust the bookshelves, accent tables and the entertainment center. The kitchen is the heart of the home. Kitchen cleaning and organization is key to keeping the home running smoothly. However there are certain tasks that should be done at least once a year during a spring cleaning project. Unplug the refrigerator and dust and vacuum the refrigerator coils in the back. While the refrigerator is unplugged, defrost the freezer and then wipe down the exterior and interior of the appliance. Clean and organize kitchen cabinets and the pantry. Throw out mismatched storage items and expired food. Wipe down and clean the kitchen counters and appliances, including the microwave. 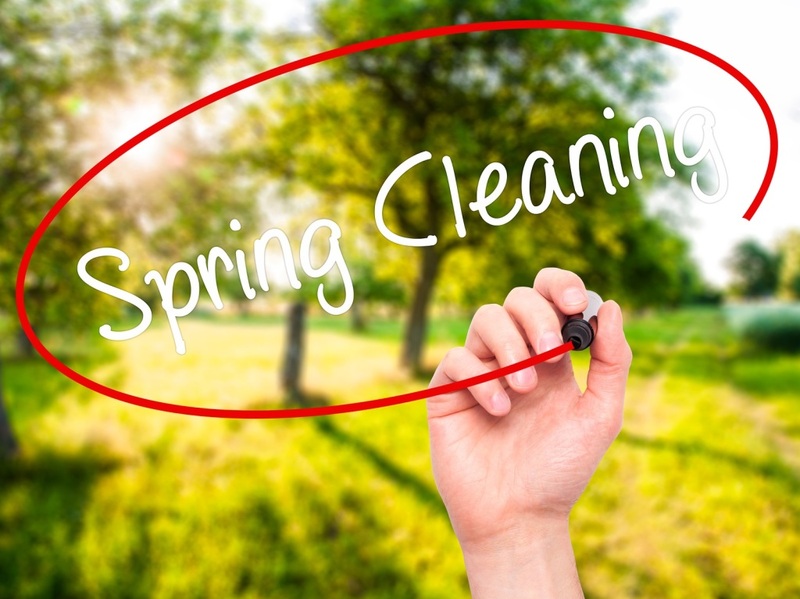 Spring cleaning is the time to switch out winter clothes and coats for spring and summer outfits and jackets. Remove all of the items from the closet. Sort through the items and decide what you need to keep and what can be donated, sold or put in storage. Use storage bins for items you need to access more frequently. Utilize DIY storage solutions for ties, scarves, purses and shoes. These can be hung on a closet door or used to create shelving inside the closet. If you follow your spring cleaning checklist you can go room by room and get it all done in no time. Renting a self-storage unit is a great residential storage option to store excess items after a spring cleaning or organization project. Storage World has a variety of storage unit sizes from 5×5 to 10×30 for household storage. We also sell moving and packing supplies to pack and store your items!